NGC 1952 is one of the most famous deep-sky object in the entire sky. Easily visible in 7.5cm, and possibly even 5cm. telescope. The Crab Nebula is the brightest and most famous and of the supernovae remnants (SNR) whose largest extent covers an area of 6′× 4′arcmin. Lying in eastern Taurus and some 1.2° NW from Zeta Taurri, this relatively easy object can be found in apertures as small as 5.0cm. Although not a true planetary, I have included it for completeness and it key interest among many amateurs. At 9th magnitude, NGC 1952 appears as a small grey oval-like haze along with a few faint stars, and the nebula bears magnification well. This Supernova Type I was mainly reported by the Chinese to have been first noticed on 04th July 1054AD. The star was so bright that it was seen for several months and unbelievably stayed for some twenty-three days visible during the daylight hours. Some believe it may have reaching the maximum brightness between -5 and -7 visual magnitude. Its remnant was accidentally re-discovered by the Englishman John Bevis in 1731. Although Bevis did not record a catalogue as such, he placed the object among sixteen others he labelled as ‘nebula’, in the Star Map of Taurus within his beautifully detail and expressive star atlas, Uranographia Britannica, which later published in London in 1750. This particular reference went unnoticed by all of the astronomical elite of the time, so Bevis’ discovery remained just an obscure oddity. In September 1758, Charles Messier also again accidentally found this object in the year of the first predicted return of Halley’s comet. Messier discovery occurred while he was making nearby observations of the now obscure Comet De la Nux. When Messier eventually publish his famous deep-sky catalogue until 1771, Bevis wrote to Messier on the 10th June to inform him that he had discovered the small nebulosity in 1731. Messier examined his claim and agreed, and then in the subsequent versions of the catalogue acknowledged Bevis’ discovery. He was so impressed with this little nebula and its resemblance to some comet, that it became listed as the first object in Messier’s Deep-Sky Catalogue (M1). Later observations by other noted observers continued, but all with the misconception that it was a collection of unresolved stars — possibly similar to some of the globulars that they also had seen. NOTE: I have merged this comment from three different sources who say very similar things. It is interesting to comment, as this is supposed to be a PNe dissertation, that Herschel believed that both the Dumbbell Nebula (M27) and the Ring Nebula (M57) showed the characteristics of a some resolution. At first I thought, in the Crab Nebula’s case, the starry field that occupies the field influenced Herschel decision of near resolution. However, he applies a similar description to M3 and M79, both globular star cluster, and the bright galaxies like M33, M81 and M101. William Herschel’s uncertainty remained. Of all the mammoth telescopes of the 19th Century, the construction of Earl of Rosse’s 1.0-metre 40-foot telescope was certainly made to answer the problems by attempting to resolving some of the nebulosities. Although the telescope turned out to be disappointing because of its bulk and the near impossibility of moving and tracking objects, Rosse did observe and draw several of the bright and questionable nebulosities in the sky. It is the representation of Figure 81 that is the most stunning. He clearly Earl Rosse is see the filaments of the supernova ejecta. Rosse presented the drawing as-is, and made no comment on its presumed appearance. In England, the distribution of this drawing through the astronomical community caused a sensation. It is uncertain who first described the shape as looking like a crab, but it certainly was not Rosse as so often quoted in the general astronomical literature. Of all the things that Rosse did, one of his biggest legacy is that the name the “Crab Nebula” was brought into common usage. The sheer number of deep-sky descriptions for this object are that many I thought it more useful to give a general précis by increasing aperture than list them all. The only real difference between these two sources is the distance. AOST1 gives 1 200pc, AOST2 gives 2 000pc. Most recent was the Supernova 1987A in the Large Magellanic Cloud. In 1987, this event reached its 3rd magnitude maximum shining for several months before dropping below naked-eye visibility. It is only the second known SNR with a bright expanding surrounding shell of gas that has been visually prominent since about mid-1998. Southern astronomers have been studied the expansion of the gas shell and established some new understanding in how supernova work. 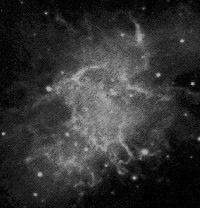 The Crab Nebula in images shows delicate structures and in some ways it is a very unique structure and has a well established with a very bright remnant. The outer areas show filamentary structure that in the main part of the familiar S-shaped structure. The prism image shows the nebulae as a stellar continuous spectrum. Within this spectrum is the bright-line spectra as seen in Wolf-Rayets and PNe's, with the lines of H , [N II], [O II], [O III], [Ne III] and [S II]. All these lines can be used to determine velocities in the expanding nebulosity. These line intensities also show the central star is hydrogen depleted, suggesting the progenitor was a white dwarf, and producing the Supernova Type I. The size of the nebulosity producing 80% of the light and the continuous spectra is about 3.2′×5.9′ in size, with the outer filamentary structures being more like 4.0′×6.0′. M1 is also a powerful radio source that was properly identified by three Australian astronomers J.G. Bolton, G.J. Stanley and O.B. Slee (1949). They also found three discrete inner sources. In 1954, Balwin showed that the amount of radio energy was twice that of the optical source. The origin of the radio energy is mainly from the filaments whose distortions are caused by synchrotron radiation in the strong magnetic fields. In the last fifty years or so our knowledge has expanded enormously regarding the Crab Nebula and the events that created it. In areas of importance, the discovery of the neutron star and pulsar has had the greatest influence regarding the progression of our understanding of stellar evolution, the final stages of stellar life and the consequences of supernovae. The latter is likely the most important aspect as many of the most important elements used by humanity have origins in the discarding of the outer shells of red giants and the explosion of supernovae. It is humbling to think that the heavy elements like gold, silver, platinum, and uranium, for example, could have only been manufactured within the creation of these titanic explosions. Some of these elements, like iodine and selenium, are even very essential for our human body’s well-being. Yet the Crab Nebula is only a single example of the passing eons of untold supernovae events that have happened since after the Big Bang. Understanding how these events really happen is not just philosophical or humanistic. Such implications have driven study into the avenues that the astronomers in the first half of the 20th Century could only dream. For example, discovery and theoretical studies of black holes, for example, which have captured so much of the public’s imagination, and have produced ramifications that stretch all the way back to the origin of the Universe. It was just over eighty years ago that astronomers were still questioning if galaxies were indeed extragalactic systems, and only just over sixty years ago that we found the mechanism of how the stars produce their energy and the chemical elements. How wonderful to live in an age where we have some understanding of the way the Universe works and have some insight of the lifestyles of the stars abd their eventual demise! In retrospect, most of these theoretical ideas about supernovae and neutron stars remained incomplete until the defining discovery in 1968 by the Englishwoman Joslin Bell of the Crab Nebula's pulsar. So unexpected was her discovery, that at first it was thought the received signals were some intermittent radio telescope problem, or that the regular pulses were sent from an intelligent race beyond the solar system. Through careful elimination and deduction she and her supervisor realised they had stumbled onto something new. The pulsar is labelled NP 0531+21 and has a period, as when discovered, of 0.0330976 seconds that in turn gives the rotation rate of the pulsar as the dizzying velocity of 30.21367 times per second. Its pulses continue very gradually to decreasing by around (•P) 36.520 nanoseconds each day, and this is sometimes expressed as the value ‘T’ of 0.0025( .P/P) being the time period lost over one million years (106). This shows that pulsar periods change very slightly. Using the slight periodic changes observed because pulsar position in the Earth’s orbit finds the distance as about 1.70 kpc. The pulsar has also been identified visually and is known as the variable CM Tauri.